Artdink have been making a name for themselves over the past few years for solid mecha games on the PSP. With the four prior Gundam Battle games, most of which were a lot of fun if a little bit of a slog at times, as well as their two recent Macross efforts. In their latest Gundam based outing though, in the form of Gundam Assault Survive, the design of these games is beginning to wear a little thin. Considering that the host platform is portable, it makes sense that the main game be based around moderately concise sections of gameplay. The earlier Gundam Battle games executed this approach very well, despite the odd difficulty spike. Assault Survive departs from this concise nature and has undertaken a sprawling approach to its missions instead. At its core you still have short missions making up the game, the difference now is that there is a map system semi-lifted from the Dynasty Warriors series. So whilst there are brief missions making the game up, they are often chained up together to make a level that’s pretty longwinded and not really suitable for a handheld gaming device. This may sound a tad unfair, as the core game and its missions are indeed excellent and the broader scope of the level map makes the conflict feel more fleshed out (as enemies can move between maps too, so defending a fleet of ships three maps away becomes as much of a skill based issues as well as a deeply tactical one). Even the whole upgrading of units is nowhere near as arduous, as you seemingly end up flush with cash at the end of each sortie. Assault Survive also borrows the shop approach seen in Macross Ultimate Frontier, so you’re never gated in terms of the unlocks as you can just buy a mobile suit to fit the occasion. Despite all this, the map system does somewhat dull the sharpness that the clearly crafted core game offers. To explain, the missions for each series start out relatively straightforward; with one map for the mission. As you progress, more maps are added and to successfully complete the mission you must fulfil all the objectives in all the maps. Switching between maps is undertaken by pressing the shoulder buttons simultaneously, this then locks onto the nearest map beacon and upon approaching it warps you to that map (delineated by letters of the alphabet). You generally know the status of each map, as yellow dots denote allies and red are enemies. This all begins to fall apart when it becomes apparent that a single mission in the older Gundam Battle games equates to one map, so when you have 9 maps to contend with you then have quite a slog on your hands. This is exacerbated by having to quickly switch between maps to defend allies, as picking out the correct map beacon requires the correct range and orientation of the player (not to mention the implicit understanding of where each of the beacons reside on that map). All this is that you can be in a situation where you have to return to a map, through several others, on your 8th map out of 9 only to have the allies you were rushing back to protect buy the farm. Due to the fact that there is no save for map progress, means you have to start it all over again. Unlike the annoying the difficulty spikes in some of the earlier Gundam Battle games, Assault Survive suffers from something far more damning; frustration through tedium. Having to re-do an entire multi-mapped mission, with each of the maps being more than manageable, only to have a defense target die and fail you the whole thing is pretty irritating. At least with a difficult mission, the onus is on the player to use a modicum of skill, with this though the game expects a greater amount of tactical forethought but not the means to execute that. This is really the main flaw as the tactical complexity is most welcome but being unable to easily move between the maps at the same kind of speed your enemies can isn’t entirely fair. Admittedly, there are some concessions to this problem as your two wingmen can be given commands. One of these is to hold position and defend a map. This works for the most part but on the longer multi-map missions many of the maps contain boss type enemies, which need the full strength of you and your wingmen to take down. The best the wingmen can do, even with a good upgraded mobile suit, is to die slowly giving you enough to time to get back to the map and take out the threat. All this may sound pretty damning and in a way it obviously is, the shame is that the core game is actually excellent. It’s just that all this new tactically focused content swamps that and really doesn’t work within the context of the gaming tools available to the player. What made the Gundam Battle games such fun was their visceral and paced approach to combat, you could initiate the final throes of the Titans or Zeon on a train ride home and feel satiated. Assault Survive is far more drawn out and would make more sense on something like a home console, where you can realistically invest that kind of time. Not to mention the lack of mid-map/checkpoint saves is pretty brutal in a game like this anyway. 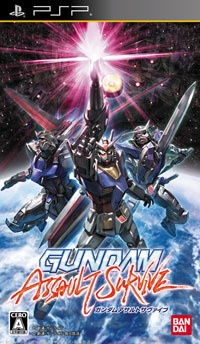 Even with the new Seed and Double O campaigns, not to mention the inclusion of V Gundam finally, Assault Survive is an unfortunate entry into once what was an excellent series of games. While I think your rating is a tad harsh, i agree that the map system makes the game much more cumbersome than it needs to be. I’ve attempted the Fed side A Baoa Qu mission ten times, with a ridiculously upgraded team of RX-78s, and still no joy! Cacophanus is a numeric rebel and sometimes uses numbers less than six when rating games, while most video game publications rate all videogames on a scale of six and up, as if the extra numbers were just there for show. I bet if Mecha Damashii’s ratings were added to GameRankings and metacritic’s average review scores, PR spokesmen would be throwing themselves out of windows and/or bribing him with fancy toys. 4 out of 10 is bad, but it’s not “as bad” as what the numbers would mean if you saw them in, say, IGN. Oh what a shame! I was really looking forward to this, even though I planned on getting it alongside Gundam Battle Universe no matter what. Or is one of the other Gundam Battle games better than Universe? I think I can put up with losing a lot of progress though, since I plan on playing most of my PSP games on a TV. That’s a good question on the Gundam Battle games; I think the first game Tactics and Universe are the two best. Much of both Royale and Chronicle were pretty merciless grind-fests. Thanks for the info! It’s hard to find really good comparisons of all the games as it is, so I appreciate the work you’re doing on all these reviews. Nuts. I was hoping to put this on my “must get” list…now I’m not sure about it. It’s a shame, since Artdink has done such a great job on it’s previous GUNDAM games. I suppose, though, that there was bound to be a low point sooner or later. Either way, here’s hoping that the next game is an improvement. To Koshernova: Man, that’s terrible! Hope you managed to finally beat that mission! I greatly disagree. Maybe it’s because i haven’t played battle universe but i love this gundam game and have invested about 130 hours into. And that’s what i love in a game, portable or not. Something has me playing that long has to be awesome. The tricky 9 map missions and bosses, yeah hard and frustrating at first. But not impossible and now i can beat all of them with no issue whatsoever. And i personally enjoy a shop system. Plus 300 mobile suits! I’m open to play battle universe but i’m not willing to pay 70-90 dollars to import it. If the next gundam battle universe/assault survive is much more like battle universe i’d more than be open to that. But reading this review it seems like the only issue you guys have is the multi-map missions and the (some but certainly not all) hard bosses. Which in that case that’s no reason to give the game a miserable 4/10. Right. What a great idea THAT was. Why bother trying to replay the mission for that SS unlock prize, when you can just buy the damn mech in the first place. Eliminating the need to play ANY mission EVER again. Play through once – and it’s done. What a great replay value discourager you invented, ArtDung. It’s not quite that overt in terms of the setup but it means there is a lot less grinding. That’s good in an action game surely?